An asteroid occultation occurs when an asteroid passes in front of a relatively bright star as seen from an observer on Earth. 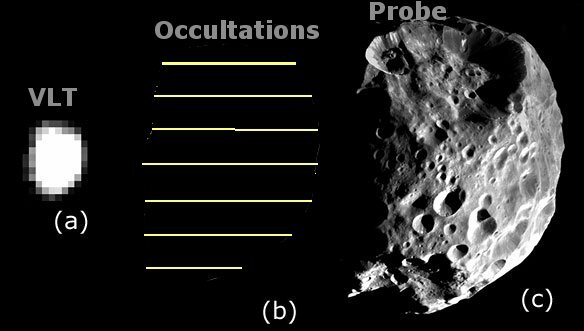 It is possible to precisely determine the size and shape of an asteroid from an occultation. The asteroid moves in its orbit around the Sun. Each observer in the path of the asteroid's shadow, will see the star disappear (time between less than 1s for observer #7 and several seconds for observer #4). A miss is also useful to determine the limit of the asteroid in space. 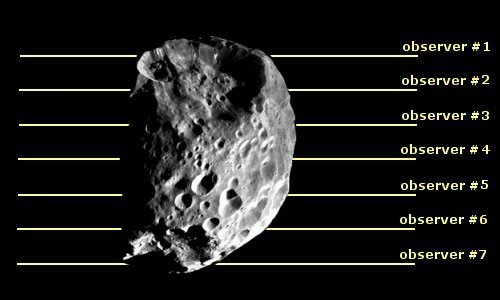 The duration of this occultation is in direct relation with the size and shape of the asteroid. His GPS or Differential GPS position (check the accuracy using 3D maps). If the observer is not using a video or ccd camera, he needs to know his observation error and reaction time delay (usually about 0.4 seconds). The very useful site of Eric Frappa: Euraster.net. The site of reference for the follow-up of lunar English occultations is that of Iota (The International Occultation Timing Association). Many things also to be drawn on the site Boreal Zenith, and not only on occultations and the transits of planets. The Site of Jean Montanne also contains interesting information on star occultations by asteroids. Beautiful images of occultations and eclipses can be seen on the site of Stefan Berine, Astrophotography. The site of Steve Preston asteroidoccultation.com has a list of future upcoming events.